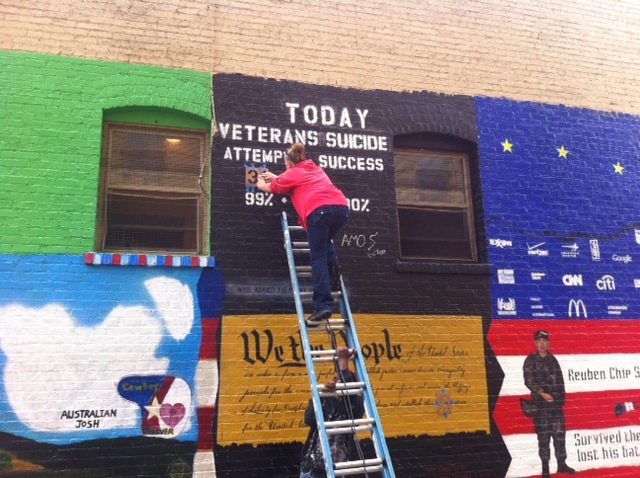 Military veterans who have been working on an ongoing mural project in a San Francisco alleyway altered one of the artworks today to call attention to the increasing problem of suicide among former soldiers. Shannon Alley, located near Geary and Taylor streets in the city’s Tenderloin neighborhood, has dozens of murals painted by various veterans as part of a project started in 2011 by Amos Gregory, a veteran from the Gulf War era. The mural altered today lists the number of suicides by veterans each day in the country. It was updated from 18 to 22, which is the estimated daily total according to the latest study by the U.S. Department of Veterans Affairs, which still does not include data from more than half of the 50 states. “Basically what they’re saying is they have no clue right now” about how many veterans are killing themselves, Gregory said. He said he started the mural project to give a voice to local veterans, primarily ones that are homeless in San Francisco. Dina Boyer, a transgender woman who served in the Navy from 1982-86, said she is currently homeless. Boyer spray painted the new number onto an alley wall and said the project is a good thing for veterans suffering from post-traumatic stress disorder. “The murals are a way for veterans to deal with their trauma creatively using paint, creativity, images, and if it helps them in the least little bit then it needs to happen, and it needs to happen in every city where we have veterans,” Boyer said. Jordan Towers, who came back from the Iraq War in 2007, said the murals also help to increase public awareness of the struggles military members face after returning from war. More information about the project can be found online at www.sfvetsmural.org.